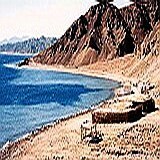 DAY 1 Early morning pick up in Eilat, cross Taba border, drive along the Red Sea coast with time to swim & snorkel the colorful coral reefs, begin our climb into the high rose colored granite mountains of southern Sinai. Cross the Valley of Pilgrims where we explore sandstone formations and rock inscriptions, view Ein Hudra oasis, possibly “Hatzerot” of the Exodus. Overnight in area of St. Catherine. DAY 2 Those climbing Mt. 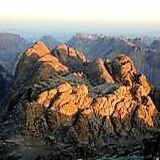 Sinai for the sunrise view will need to get up in the middle of the night. After breakfast we visit St. Catherine’s monastery, the “Burning Bush”, & “Jethro’s Well”. 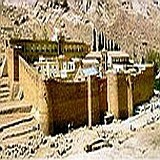 St. Catherine’s, with its massive high walls to protect it from marauding Saracens, was built by the Byzantine emperor Justinian in the 6th century. Lunch and return to Eilat, in the afternoon. 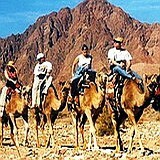 Interested in making a Mount Sinai & Red Sea safari in the footsteps of the Exodus? Ask veteran guide and biblical archaeologist Zack Shavin at Land of Israel Tours.